Grease a 20cm shallow cake tin with butter. Mix all the dough ingredients together in a bowl, I sort of squeeze it together! Be careful with the milk, it needs to be warm, not hot, or it will kill the yeast (oh and make sure you throw away the whole spices you used to infuse in the milk!). Once you've bought it all together knead on a floured board for 10 minutes. As this is an enriched dough it's sticky, so the smug people with dough hooks will come into their own here. The rest of us, if you keep going it will eventually stop being sooo sticky! 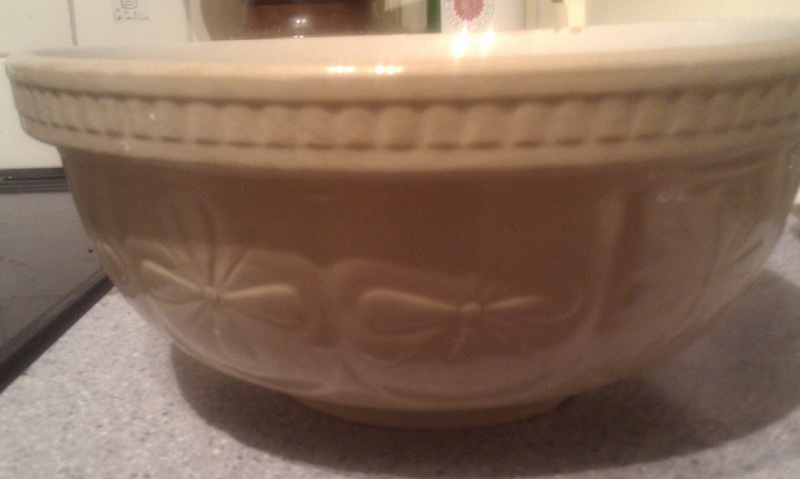 When the dough is nice and elastic, pop it in a clean bowl, cover with clingfilm and leave for one hour. After the hour it should be nicely risen. Knock it back and divide into 12 pieces. Try and get them roughly the same size, but don't go to the effort of weighing them. Roll each piece into a ball until you have 12 balls of dough. Place the dough balls into the cake tin, fairly regularly spaced out. See mine really aren't even sizes to say the least! Once you've got them in, squash them down a little with the palm of your hand, so they just start to touch each other. 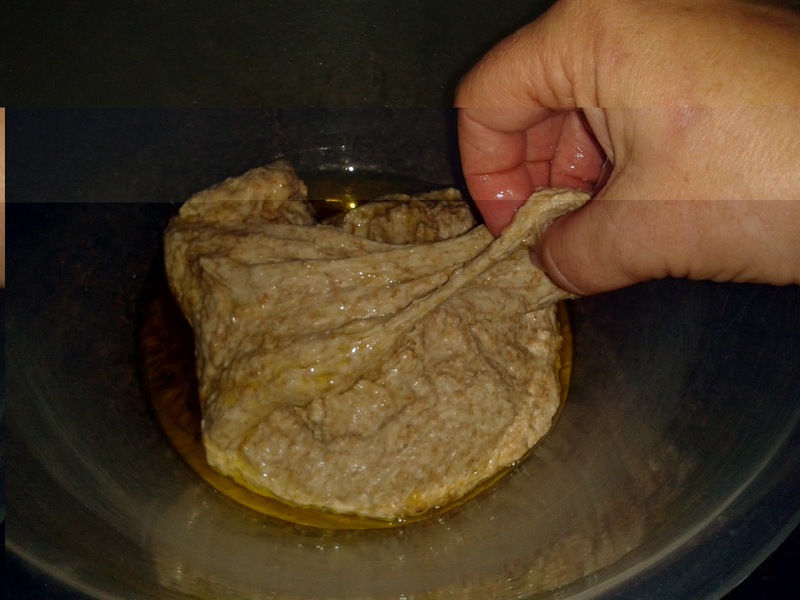 Cover with a cloth and leave for 40-60 minutes until they are well risen. Before you say bye bye to them though, pop the oven on to 160 degrees to get it warmed up. Once the dough balls have risen pop them in the oven for around 7 minutes. They cook very quickly and it's wise to keep an eye on them. They'll probably need another 4 or 5 minutes after this, but you'll be able to see how cooked they are and if any side is colouring more than the other. Once you are happy they are cooked, take them out of the oven and leave to cool on a wire rack for 5-10 minutes before you try to get them out of the tin. Then leave to completely cool. See what I mean about them cooking quickly? Just about caught this one before it burnt over-coloured! Mix the icing sugar with some of the juice of the orange until you have a drizzling consistency and 'drizzle' over the cake. Frankly all my icing is of a drizzle style. That's the way I roll! Sprinkle with the almonds. You'll want/need to eat this cake fairly soon after you have made it, it dries out very quickly. The pics above are actually for the first version I tested with a cinnamon and vanilla icing. This was nice but the consensus was that the orange icing worked better on version two. However, I didn't get around to photographing that one! 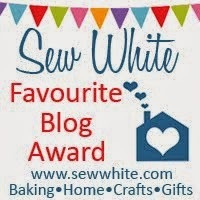 We invited our Twitter friend, Edesias Kitchen, to write our first guest post. Edesias Kitchen is an innovative culinary service providing people with a wide range of fantastic food (particularly great bread and pastry) including a bespoke catering service brought to your own kitchen. I was very flattered having been asked to write a guest blog for the extremely talented Blackbird Bread, so with this in mind I wanted bring to you a little of what I enjoy creating. Having spent over 17 years in food science (in particular the microbiological and nutritional analysis of food) and then a spell of working in food manufacturing I decided to embark on a lifelong ambition to have my own business creating and sharing my enthusiasm for food. Throughout my life bread and pastry has always been my biggest passion (and guilty pleasure). All of my spare time is put into creating recipes as well as trying out other people's ones. My biggest flour hero is Dan Lepard and as I also enjoy cooking the French classics so is Raymond Blanc. I have taken a lot of inspiration from both of these experts. So now my aim and focus is to be able to share with others my knowledge and passion through my Edesias Kitchen courses and catering. Having recently been asked if I could make a wholemeal focaccia I automatically though 'flat brick', but then it got me thinking… I tweeted some of my floury contacts in the Twitter world and gained a bit of an insight to what others thought. Interesting comments prevailed so I then called up one of my Italian friends and asked her what she thought. I learnt some colourful Italian superlatives and took that to mean as really she didn’t think much of it as a concept! 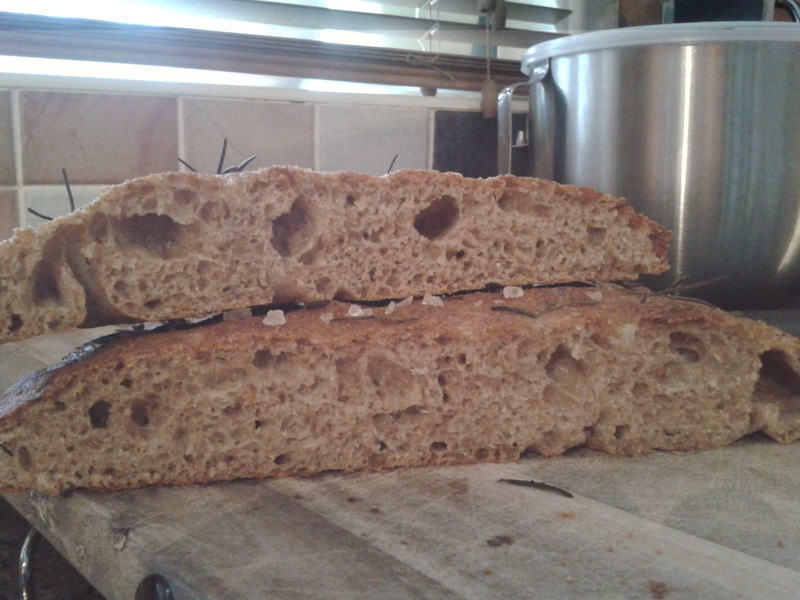 So me being me (I’m no defeatist) I got out my bowls, the yeast, the flour and with a bit of peer inspiration and some experimenting I came up with the following. A fabulous light as a feather, Rosemary and garlic wholemeal focaccia. I feel that the beauty of this recipe is that you can be doing something else while it's sitting in its bowl… its (nearly) effortless. You will also need a large plastic bowl and a smaller plastic bowl. Mix together your flour and salt in the smaller bowl and set aside. 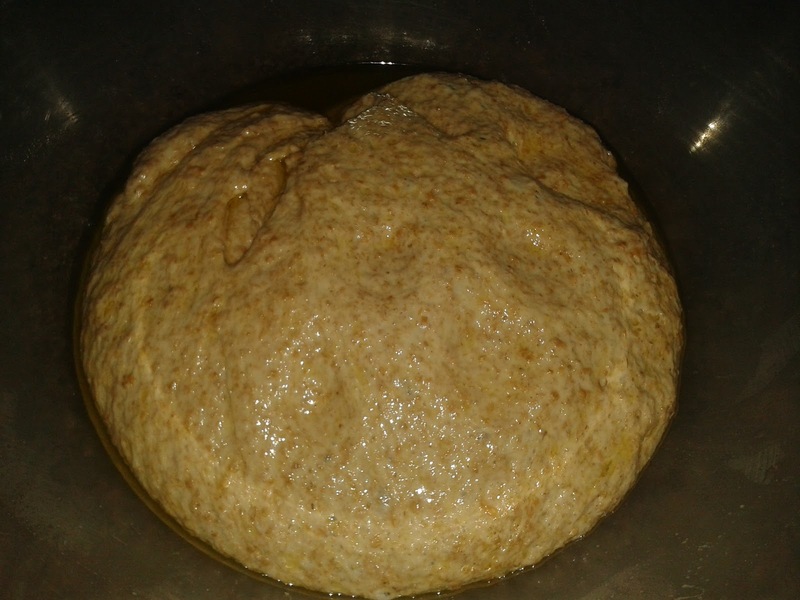 In the larger bowl mix the yeast with the water. 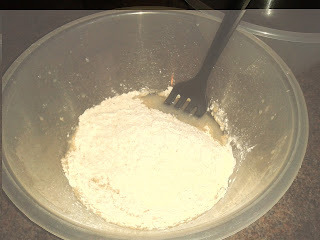 Tip the flour and salt mixture from the small bowl into the yeast and water bowl and mix together really well. (I use a large plastic fork for this). This dough will be really quite sticky and you will probably need to use a dough scraper. Clean around your bowl with your dough scraper and add the 25g of olive oil at the bottom of the large bowl. 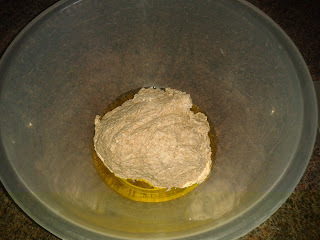 Sit your sticky dough in the middle of it cover it with the smaller bowl… and leave it alone for 30 mins to up to an hour . It's up to you, but remember, the longer you leave it the better the flavour! After your chosen rest time, fold the dough bringing the outside to the middle four times in the bowl, cover again and repeat this folding/resting step three more times. After the final fold and rest, your dough should be soft and pillowy with most of the oil incorporated into it. Take your dough out of the bowl and place it on a prepared baking tray lined with some baking parchment. Gently press your dough using your fingers to make the lumps and bumps. At this stage I used some fresh rosemary from my garden and drizzled it with some garlic infused olive oil and a sprinkling of sea salt. 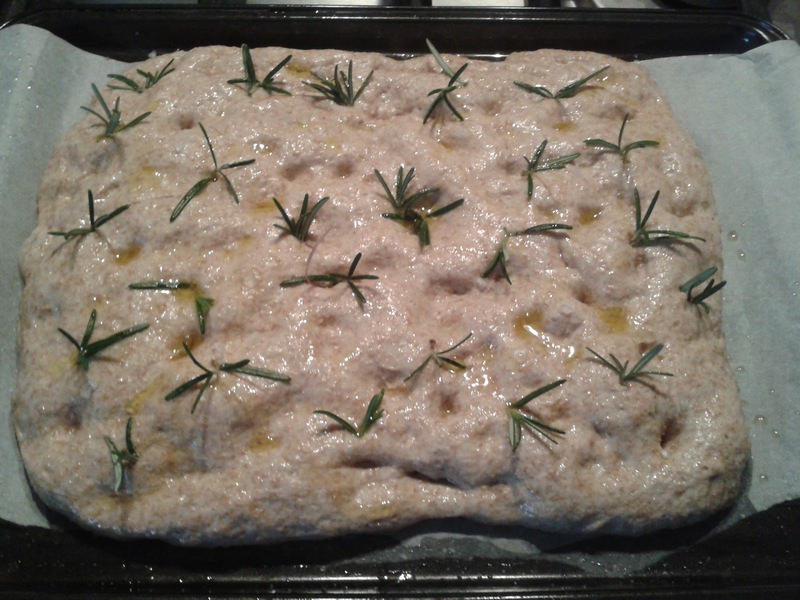 Let the focaccia rest and rise again for around 20 mins. Bake for around 10 mins at 250oC then turn your oven down to 220oC and bake for a further 10 mins until a rich golden colour (remember oven temperature differs from oven to oven, you may need a longer or shorter bake). Your final bake will hopefully look something like this, a beautifully light as a feather, garlicky, salty, chewy wholemeal focaccia. Enjoy! I've got a fairly substantial collection of cook books, a few Nigellas, a shelf of Jamies and an array of Delias. Some I cook a lot of things from, some (and I'm talking about you here The River Cafe cookbook) barely see the light of day. Skulking around on the bottom shelf, a bit unfashionable although affectionately remembered, is The Dairy Book of Family Cookery. Those of you of a certain age may remember this fella. Produced by the Milk Marketing Board, my mum purchased this from Hank our milkman (no idea what his real name was but he looked like Hank Marvin) in 1983. It was one of the first cookery books I'd ever really looked at and probably the first one I tried to cook something from. For some reason I went for saute potatoes, which may give you an insight into the aspirational 80s style of the book! To be honest, these days I don't really make anything from it, I think in the main I like to keep it around for the nostalgia. With one exception. Quick pizza. I know what you're thinking, quick pizza either involves 'a mum's gone to Iceland' or 'where's that Dominos leaflet gone?' scenario. Both of which are viable alternatives when a pizza emergency calls (and I have to say both crop up in the Blackbird Bread coop). However, if I have some time, and the ingredients, I'll often knock this up for Saturday lunch. It's ideal if you fancy a homemade pizza but don't have the time or inclination to mess around with bread dough (even Mr B feels like this on occasion). whatever you fancy - we usually have child-friendly toppings (ham, pineapple, sweetcorn) and less child-friendly ones in disguise (mushrooms, peppers, tomatoes, tuna) not necessarily all on one pizza! Put the flour and salt in a bowl and rub in the butter (room temperature will make your life easier). It needs to look like breadcrumbs. Gradually add the milk (you may not need all of it) to make a soft dough. Bring it together a bit with your hands then tip it out onto a floured board. You'll need something to cook the pizza on, being bready people we have a stone which we also use for bread making. If you have one, pop it in the oven to start heating up around 180 degrees. If you don't, use something like a fairly strong, flat baking sheet or tray. You get a better result if you heat the stone or baking sheet first, and transfer the pizza onto it when it is assembled - tip from Rachel Allen below. Frankly, this can be a slightly hazardous process, as you may lose the pizza or the hairs on your arms, so if you don't fancy trying to get the pizza on to a hot tray or stone just put the base when it is rolled out straight onto an unheated one. You may just need to make sure the bottom isn't soggy when you take it out of the oven! I digress, back to the dough, knead it a little on the board, roll into a ball and then using a rolling pin, roll it out to around 1cm thick. You'll need to shape it a little to reflect the shape of the tray or stone you are using. Put to one side while you make the sauce. For the tomato sauce, heat the olive oil in a pan. Add the onion and cook for 5 minutes until it has softened. Add the chopped tomatoes, tomato puree and seasoning and leave to cook out and reduce on a gentle bubble for around 20 minutes. Sometimes I get the sauce on first before I make the base, I like to mix it around - that's how I roll. You want it to reach the point where you have a thick sauce and most of the liquid has gone. This may make more sauce than you want to put on you pizza, but I tend to use the whole tin of tomatoes and save the extra sauce for pasta or another pizza. *You could just avoid this and use tomato puree and spread it straight onto the pizza base. However, I find the flavour a bit dull. And I find the extra sauce handy for the freezer. Spread the sauce on the pizza base, as much or as little as you want (although remember the more moisture you have from the sauce or the toppings the more will soak into your base). Sprinkle over the oregano (I like to add it here rather than in the sauce as it tastes more herby in the finished pizza, although I've also added it to the scone mix too). Arrange your toppings and sprinkle over the cheese. If you are using a preheated tray I picked up a tip from Rachel Allen of using a flat cold baking sheet or tray to transfer the pizza straight to the preheated one in the oven. You just need to sort of slide it over and give it a little flick (and Aretha style, possibly also a little prayer!). If you are using a cold tray just pop it in the oven. It will need around 20-25 minutes depending on if you pre heated your tray or stone. There is nothing like a good white loaf, thickly sliced with butter oozing all over it! 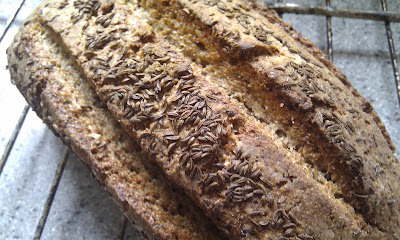 And there is nothing better than the smell of a loaf cooking in your own oven. This post will show you how to do just that. You don't need to spend a lot of money and the end result is incredibly rewarding. Heather recently asked me how to make a loaf. A simple enough question, but she asked the question almost a month ago, so this has been a long time coming! We thought a post on the topic would be a nice idea and a way to acknowledge all the help Heather has given us. It uses lots of the photos we take a various stages of bread making - so forgive us if the light changes in the pics, or if the dough looks different - it's really the technique that's important here! (The important thing about this technique is the shaping of the dough into a round, which is why the pics focus on that area). The recipe below is designed for people who've never made a loaf before. It makes the assumption that you don't have specific baking tools or kit and uses a roasting tray for the dough to be baked on. 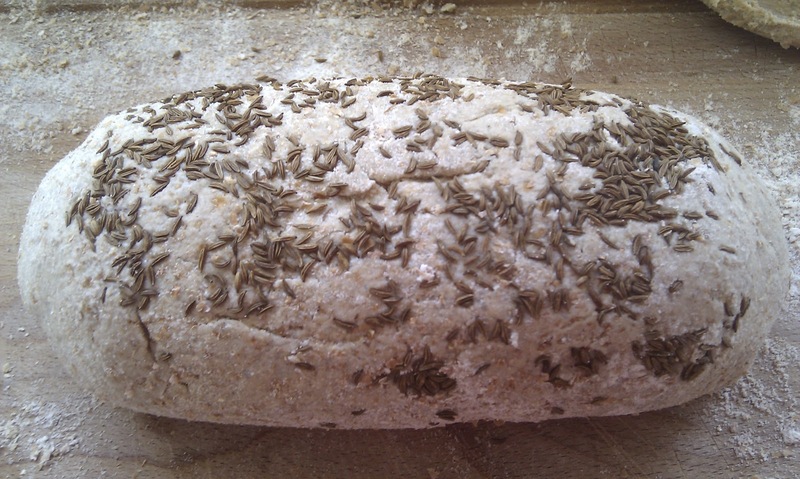 It proves (pardon the pun) that you don't need loads of specialist stuff for bread baking, what you do need is a little bit of patience. Place all the dry ingredients into the mixing bowl. Using the wooden spoon, mix together, then gradually add the water, stirring. This will get easier as the mixture turns to dough. There is no set amount of water, so you may not need all of it. Add the water until the dough is sticky but not sloppy. 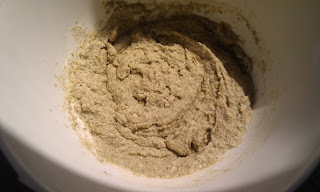 (Note: if you have added too much water, add more bread flour a handful at a time). Stir it until you have a soft dough and form into a round. Turn out onto a lightly floured chopping board. 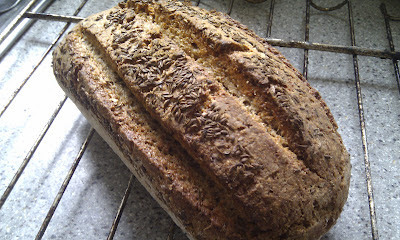 Don't use too much flour or you'll be sweeping up for the remainder of your day - it can also make the finished bread dry. Knead for ten minutes. No skimping now. It needs it! You can’t do this for less, as the gluten in the flour needs to develop and stretch. Use whatever kneading technique you know. As long as you keep stretching the dough, using one hand or two, then you'll feel the change in the dough after several minutes. If it gets too sticky, add a bit more flour, some to your hands and some to the board. After the knead, prod the dough with your fingers until almost flat. Now stretch the dough into a ball, as follows. While holding the dough with one hand, grab the tip of the dough with your other hand and gently stretch it, try not to break it, then fold it back into the centre of the dough. Flip the dough over and, using the upturned palms of your hands, shape the dough into a ball, carefully spinning the dough and sealing it underneath. You now have a bottom and a top to your loaf – the top is facing you and should be smooth and the base will look like origami! Wipe the mixing bowl clean, sprinkle with a little flour and place the dough inside it, bottom side down, sprinkle a little flour on the top of the dough then cover the bowl in clingfilm and leave for 45mins-1 hour. It doesn’t have to be in a warm place, the clingfilm will create its own warmth for the dough to prove. After the first prove the dough should have doubled in size. (If it hasn’t, leave for an extra 30 minutes). Remove from the bowl onto a floured work surface, flip it over and knock it back. Don’t ever punch it or anything macho. Use your fingertips as described above, prod it all over, turn it the right side up, shape into a ball again and leave on the chopping board, covered in a teatowel for 15 minutes to rest. After this resting time, flour the chopping board and flip the dough over. 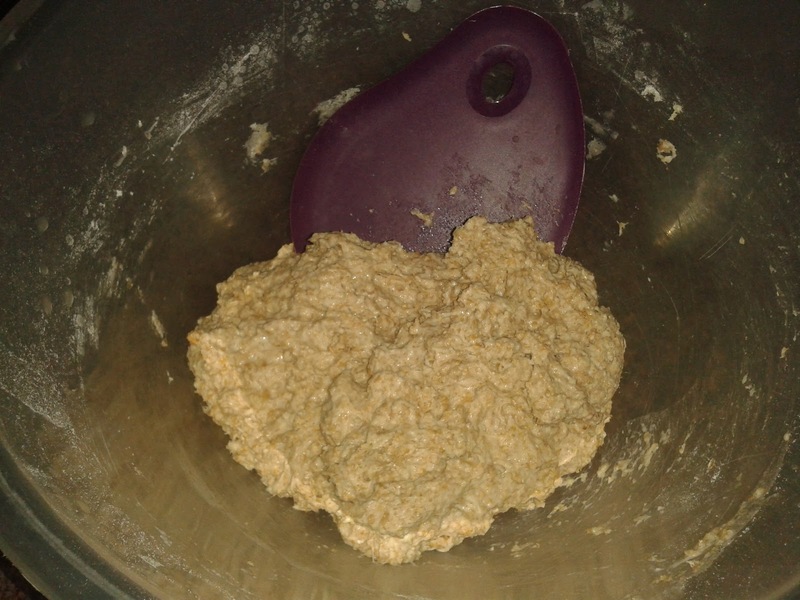 Prod it all over again, and, once again, using the upturned palms of your hands, shape the dough into a ball, carefully spinning the dough and sealing it underneath. 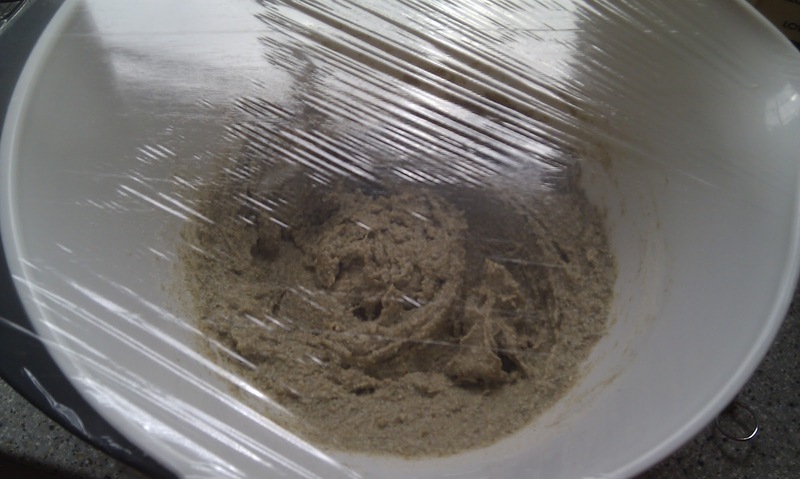 Place the dough inside a lightly floured roasting tray, cover with a teatowel and leave for 45 mins to 1 hour. (it should have have doubled in size). At this point switch your oven on to 200c, it needs to be nice and hot. When the loaf has doubled in size, carefully slash a cross in the top of the loaf with a sharp knife (this will help the dough to rise in the oven, helps the hot air escape so the loaf doesn't explode and looks very flash!). Don't cut too deep! Sprinkle the dough with cold water (using a water spray or your fingers) and place the roasting tray into the oven. Bake for 10 minutes at 200c, then reduce the temp to 180c for another 15-20 mins. (Tip: turn the loaf around at 10 minute intervals to stop any potential burning). After 25-30 mins, turn the loaf over and bake the base for at least five minutes, until it makes a nice echoing thump when tapped on the base! Place on a wire rack and let it cool completely before getting stuck in! Please don't slice it while it's hot, or even warm, you risk losing a lovely loaf! Bless it! I have no idea how old it is, I inherited it (as I have a lot of my kitchen kit) from someone else. 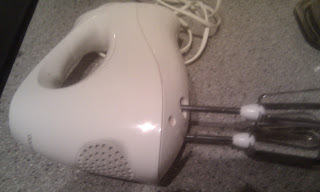 I got to thinking the other day about kit and we when you bake or cook a lot you tend to rely on certain pieces of equipment. I'm personally still in mourning for a particular wooden spoon Mr Blackbird broke; it was my favourite scrambled egg/white sauce making spoon, with a little pointy bit at the end - for the pan scraping. I've realised that the kit I use the most, and that I'm most fond of isn't that expensive (as I said above a lot of things have been passed down to me). So alongside my relic from the 70s (I think) these are the others in my top 5. Actually, this is one I did buy, solely because Delia informed me (reliably as it turned out) that making royal icing by hand with a balloon whisk wasn't something you wanted to get involved with. But in the stead of a the aforementioned freestanding mixer it has served me very well. Many of Blackbird Bread's drizzle loaf cakes have been whisked by it and unlike my handheld blender whisk attachment it doesn't start to burn out at the first sign of some 'not-very-well' softened butter. Now this has served me well over the years and is still a kitchen classic. Another inherited piece. Yes, I've got some nice modern plastic mixing bowls with non-slip bottoms and lips for ease of pouring, but this makes me feel like I'm doing proper grown up baking! Probably because growing up all the mums I knew had one. I love this little chap. He came free with a magazine and was once pink. 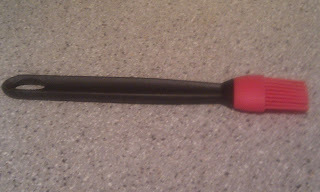 He's had loads of use and is considerably more flexible and useful than the spatula I actually paid money for. 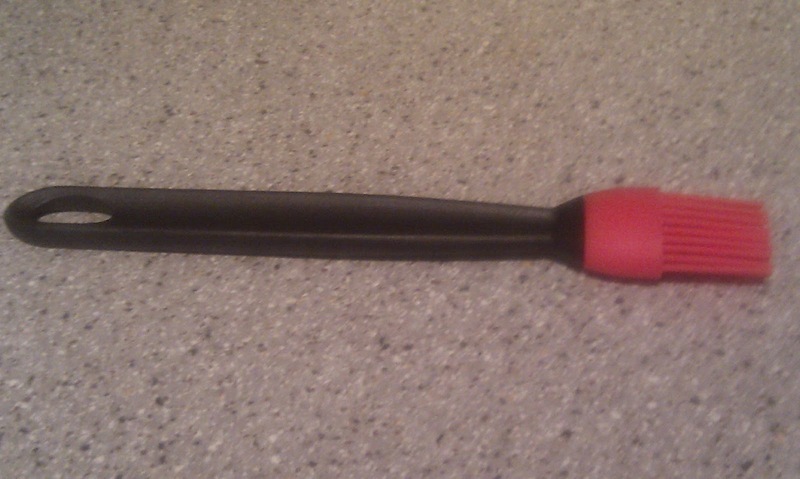 Aah, only higher in my affections than Mr Spatula comes my silicone pastry brush. Once this fella came into my life I was no longer afflicted with old-style brushes that would moult over my pastry (looking suspiciously like cat hairs). I think I paid a whole six English pounds for this, but he's a top investment to avoid guests looking worriedly from the ginger tom to their plate. To be fair, I am a bit obsessive about my kitchen (not that it is anything to look at). Sharing it with Mr Blackbird Bread can be an interesting experiment in marital harmony. And I also have a habit of tidying up his work surface which, if it was the other way around, I would consider emotional cruelty! I'm not too bad about sharing the kit (apart from that wooden spoon - think you can gather I'm still smarting about that one) in fact in the background he's making breadcrumbs (some loaves just don't make it!) 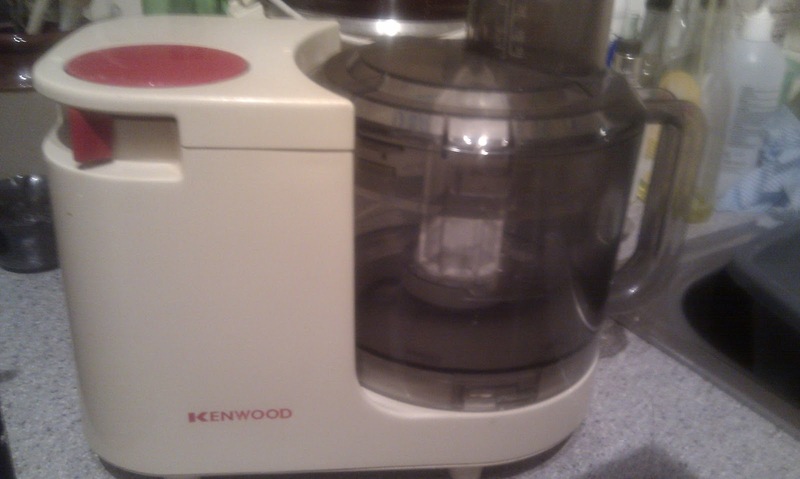 in the ancient Kenwood mixer. Although that may change if I ever get may hands on a KitchenAid. So, I guess what I'm saying is sometimes it doesn't matter how much something cost, how you came by it (as long as it was legal) or who you share it with, love your kit and it will serve you well. Ah, a wood fired oven. The smell of burning flesh, mosquitoes singing in your ears and bread you can't see and a temperature you can't control. Heaven! We recently stayed at a farm that let me use their outdoor wood fired oven, (yes, yes, I baked them a loaf too!). I was incredibly nervous and excited at the prospect, especially as they mentioned no one had tried to cook a loaf in it before, they use it for pizzas. The oven was lit around three hours before I needed it. I was reliably informed by the farmer, that you shouldn't use the oven until all the wood is white and has turned to ash, like a barbecue. The only other guidance I had was from my ever faithful Daniel Stevens' Bread book (essential purchase by the way) who memorably talks about using a clay (not wood fired) oven in his great book. He says the oven's ready when the hairs on your arm start to char! As I wanted two loaves, I halved it (approximately), formed into rounds and left for a further quarter of an hour. Then I covered them in a bin bag and left for another hour to rise again. I put them onto the farm's impressive-looking peel, shaped again and gave them two horizontal slashes with a breadknife followed by a good soaking of water. Gloves on (no, not those ones from your Auntie at Christmas, proper ones! 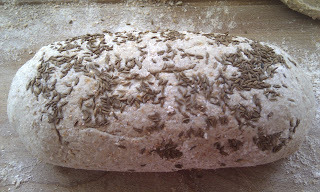 ), I opened the door and popped the loaves in one at a time. Now, this is the interesting bit. I couldn't move and had to time everything very carefully. In four minutes, I opened up the door and was saddened to see that one loaf had burnt slightly. Lesson learnt - don't put the loaf too far back in the oven (as the wood is pushed to the back when the oven is ready so the majority of the heat is there). The closer to the door the better I would say, or the heat is too much and you are at risk of charring the crust and under cooking the middle of your loaf. I moved them around every two minutes and in seven to eight minutes they were ready to come out. This is the one I'm happy to share with the world! The taste was amazing, like nothing I've tasted. The effect that the wood fire had on the crust was unbelievable. Next time, I will place it nearer to the door and leave it undisturbed for two minutes, then turn it around every two minutes until the base goes boom boom boom, like my heart was! This loaf is based on Dan Lepard's Light Caraway Bread, as included in 'The Handmade Loaf', but the version I make is certainly not light! It includes different processes and ingredients, plus it takes considerably less time and far less washing up (both essential for bakers!). The biggest difference, preparation wise, is that this method only uses one bowl. As much as I like Dan Lepard's book, it's a bit top heavy on the washing up and bowls used! 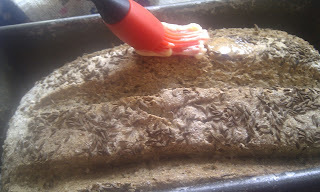 However, there is no getting away from it, this is a particularly messy loaf to make. You will be washing gunk off your hands at least twice during the prep, but it really is worth it, believe me! And, importantly, it doesn't require an overnight prove, so let's get started! The loaf requires a ferment, a starter if you will. First, find a big bowl. This will be used throughout the recipe. Make it a good one! And for goodness sake use a wooden spoon throughout, not your hands! Combine the milk with either the buttermilk or lemon juice and leave for half an hour. Put the kettle on, have a cup of tea and get out the rest of the ingredients needed for the ferment. 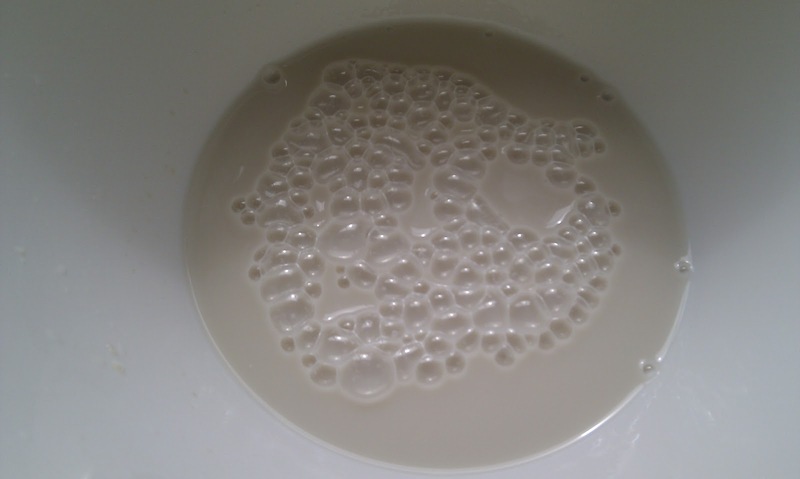 After half an hour, when the sour milk is a thicker, or lumpy, whisk in the water and the yeast. And I do mean whisk! 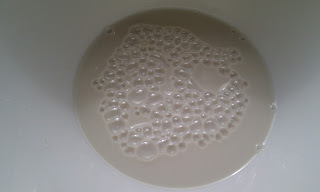 Get lots of bubbles going at this stage, one or two minutes will do, until the yeast is dissolved. Then add the rye flour, stir to a thick paste, cover with clingfilm and leave for 90 minutes. Ninety minutes gives you ample time to clean your house, or wash your car. Or you could check your Twitter account. Frankly, do as you please, but make sure that at some point in that time you tip a generous handful of caraway seeds onto a baking tray and put into a preheated oven for 8-10 mins, until lightly toasted. Turn the oven off after this. After 90 minutes, the ferment should look like this. . .
You are now going to make the dough. 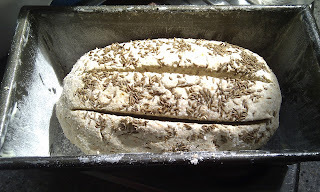 Tip most of the caraway seeds into the ferment leaving a few back for later, followed by the tepid water and the yeast. 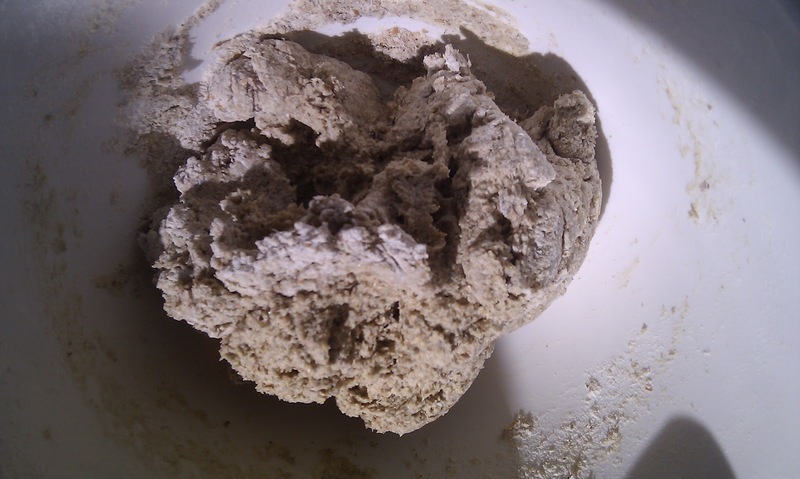 Stir gently then add the rye flour, the wholemeal flour and the salt. Bring together adding more wholemeal if it isn't binding together. Flour a work surface. 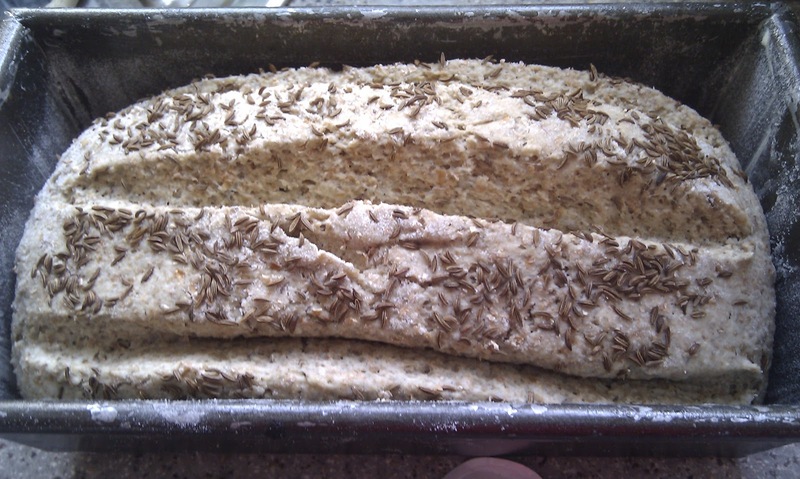 The next bit is a bit sticky, so have more flour ready (wholemeal is best). Turn out the dough onto the floured work surface, pat out into a 10cm square then roll up into a cylinder. Very gently knead and roll for 30 seconds, gently pressing down to seal the seam. 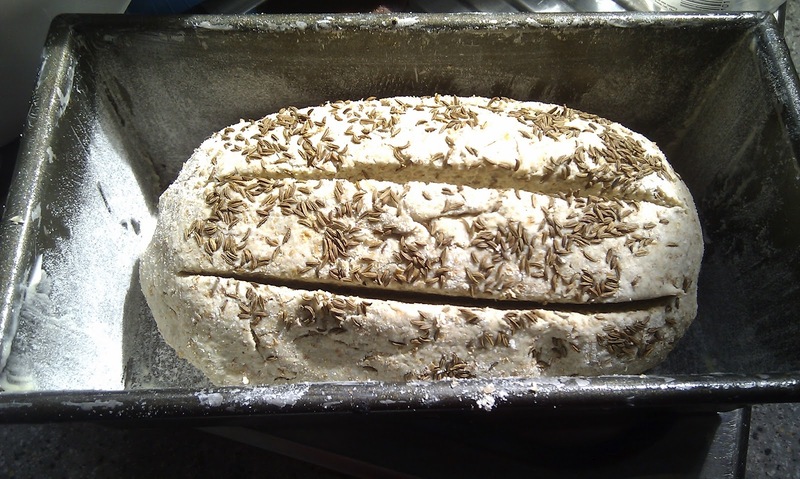 Tip the remaining caraway seeds onto the work surface, sprinkle the top of the dough with some water and roll the top of the dough onto the seeds. Grease with butter and flour a 2lb loaf tin, place the dough inside and, using a sharp breadknife, (or whatever you normally use for slashing bread), carefully cut three long slashes into the dough. 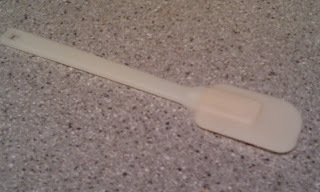 You may need to run your knife under a tap as the dough is very sticky! 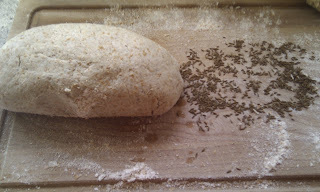 (The reason for slashing so early on is due to the heaviness of the dough). Cover with a linen/cotton cloth and leave for one hour. Switch the oven on to 200C. 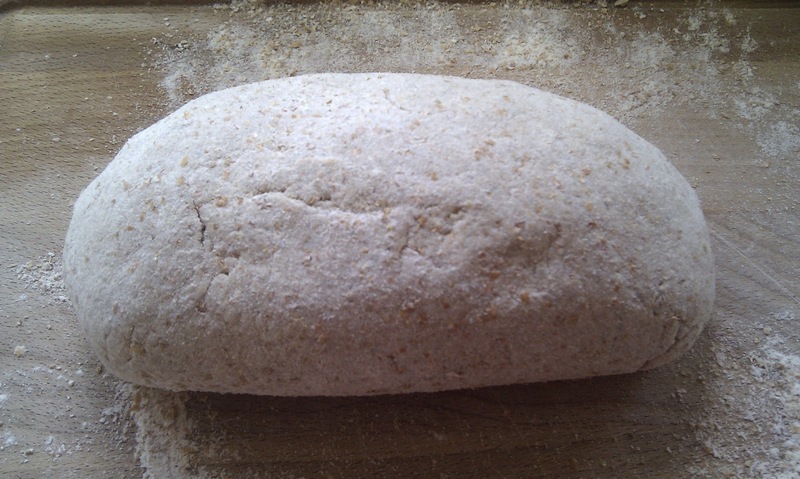 After one hour, the loaf has proved nicely, slashes expanded so let's bake this beauty! Pop it in and leave for 30 minutes, or, if like me you use a domestic oven, check it after 20 minutes and turn it around to stop the oven from burning it on one side! After 30 minutes, brush the loaf with the butter, on the parts that you didn't slash and pop back in for another 15 minutes. The smell of caraway seeds, wholemeal and rye flour should now be filling your kitchen. That means it's ready! Out it comes, take it out of the tin (turn it upside down and pop it back in the oven for another 5 minutes if the bottom looks too pale, or doesn't give out a hollow boom when tapped), onto a wire rack and leave to cool. Enjoy!